Man Booker Prize Winner Is Paul Beatty, First American To Win British Prize : The Two-Way Beatty won for The Sellout, a satire hailed as hilarious about the fraught subject of race in the U.S. 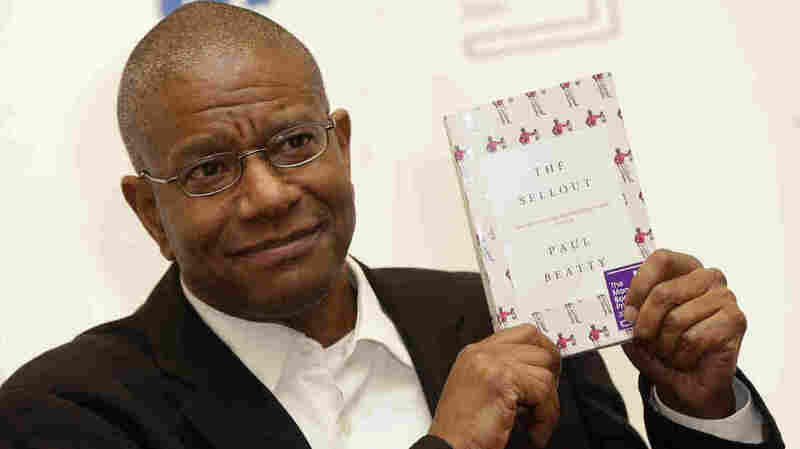 The competition was opened recently to any author writing in English and published in the U.K.
Paul Beatty is the first American to win the U.K.'s Man Booker Prize for fiction for his novel The Sellout. The Man Booker judges chose a distinctly American story for its first American winner. The narrator of The Sellout is a black man from a small town on the outskirts of Los Angeles. The town is so down-and-out that it is being taken off the map. In response the narrator, known as Bonbon, re-instates both slavery and segregation in the town. Those moves land him at the Supreme Court where the books begins. At this evening's award ceremony in London, Beatty told the crowd that the book had been hard to write and he added, "I know it's hard to read." That may be true but it's also very funny. The Sellout has been called "a comic masterpiece." Beatty was one of two Americans up for the Man Booker Prize this year. Until recently it had only been awarded to writers from the United Kingdom or Commonwealth countries. But three years ago it was opened up to any author writing in English whose book has been published in the U.K. That raised some concerns among British writers and publishers that Americans would dominate the award which is not only prestigious but also helps boost the sales of the winner. In the last three years, a number of Americans have been on both the long and short lists for the award. But they haven't taken over. The other American nominated this year was Ottessa Moshfegh for Eileen, her first novel. There were also two Canadians, Madeleine Thien author of Do Not Say We have Nothing and David Szalay for All that Man Is. Two British authors, Graeme Macrae Burnet for His Bloody Project and Deborah Levy for Hot Milk rounded out the list.